My son A is a big fan of Peaches, he will ask for it every so often, even when peaches are out of season. It goes without saying that peaches are always in sight at home during its season! 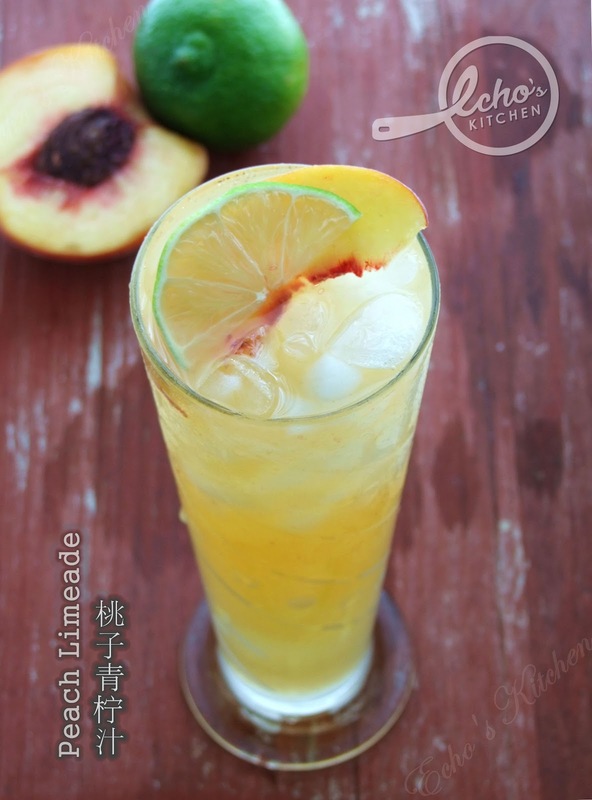 I brought home some sweet juicy peaches from the market and decided to make this delicious limeade, a perfect drink for summer afternoon! 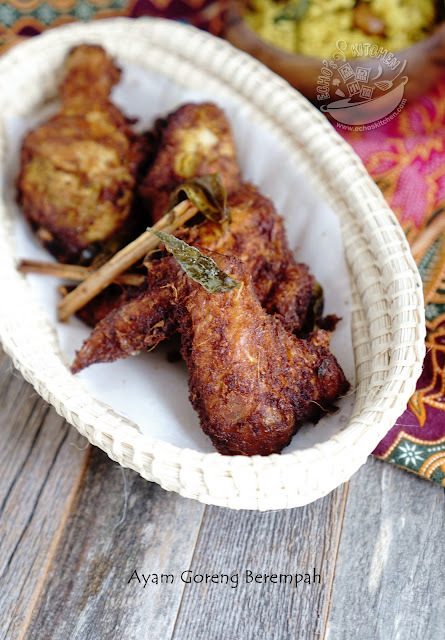 This spiced fried chicken was made last weekend to go with some steamed rice and lentil soup, my all time favorite combination. This fried chicken is normally served back home with Nasi minyak or Nasi Lemak. 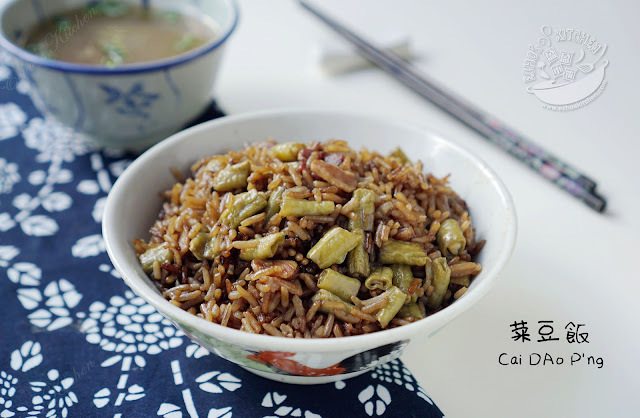 My mum used to make this long bean rice back home, there are similar dishes made with pumpkin, Chinese mustard (Gai Choy) and yam. It is prepared almost like Spanish Paella, the rice is cooked together with ingredients and seasoning, in a pot/wok and later simmer to perfection. 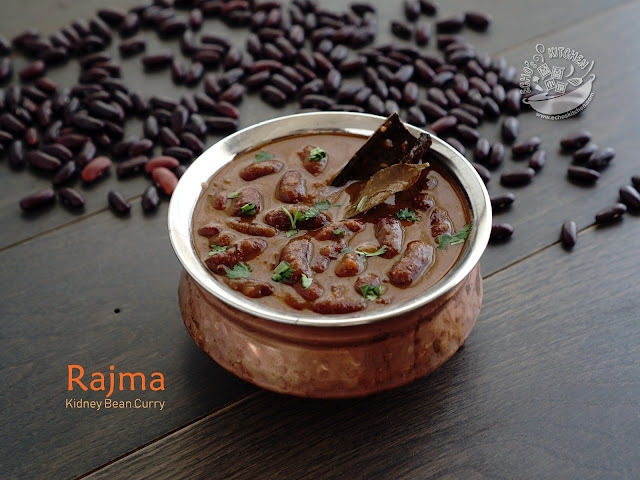 It is simply irresistible, every spoon of it is a charm! 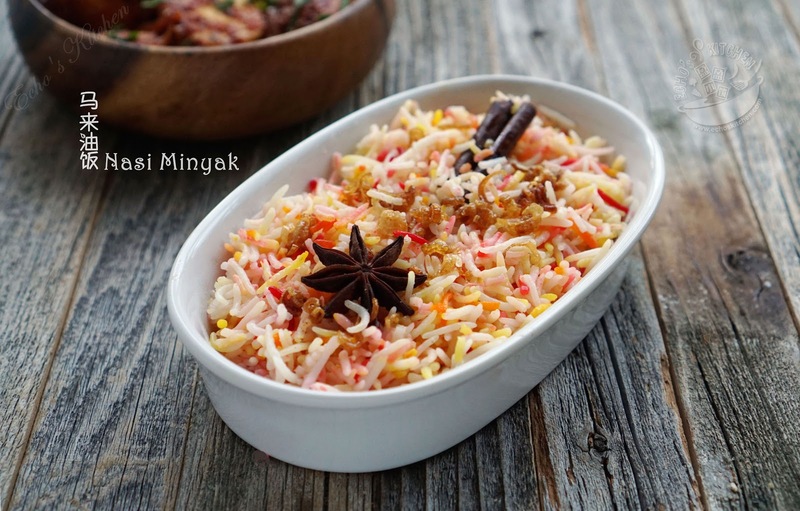 Nasi minyak is synonymous with wedding for most Malay back home, it is one of the main dishes served at the wedding reception. I used to look forward to a Malay wedding to enjoy the feast when I was young. Malay wedding reception is a true spirit of "Gotong royong" (Communal work), most people in the village (Kampung) gathered together to share the tasks of cooking/preparing for a reception. Every village/kampung has its own team of cooks for such occasion, in other word, every village has their own specialty that passes down generation after generation. I made Nasi minyak last weekend for a gathering to go with my Malaysian mutton curry, Ayam Goreng Berempah and Achar Timun, everyone enjoys it very much, it was a perfect meal! 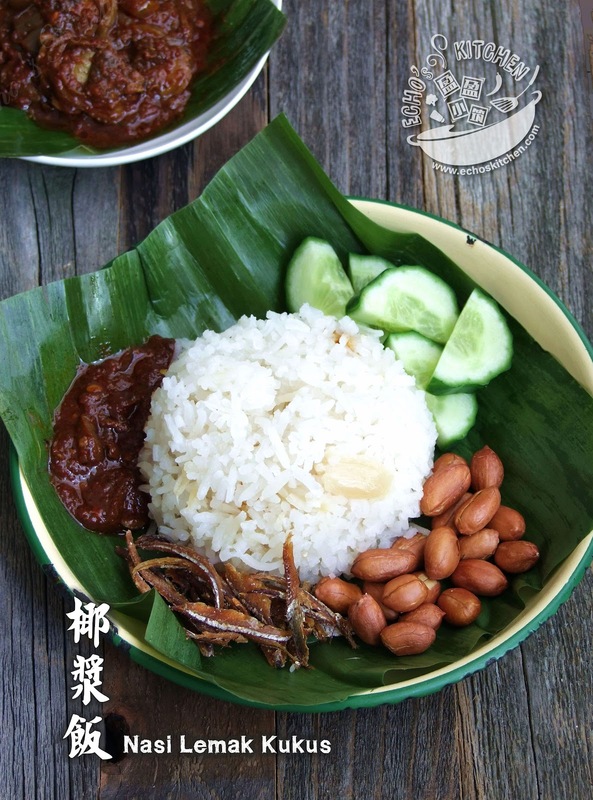 This Lotus Leaf Rice is a very common dish served at Chinese wedding dinner back home. It is normally served last to ensure all the guests are well fed. It is a very thoughtful arrangement and I always love the taste and fragrance derive from lotus leave. Sweet，juicy local grown corn is one of the benefits of living in NJ, we loved it grilled, buttered or steamed. 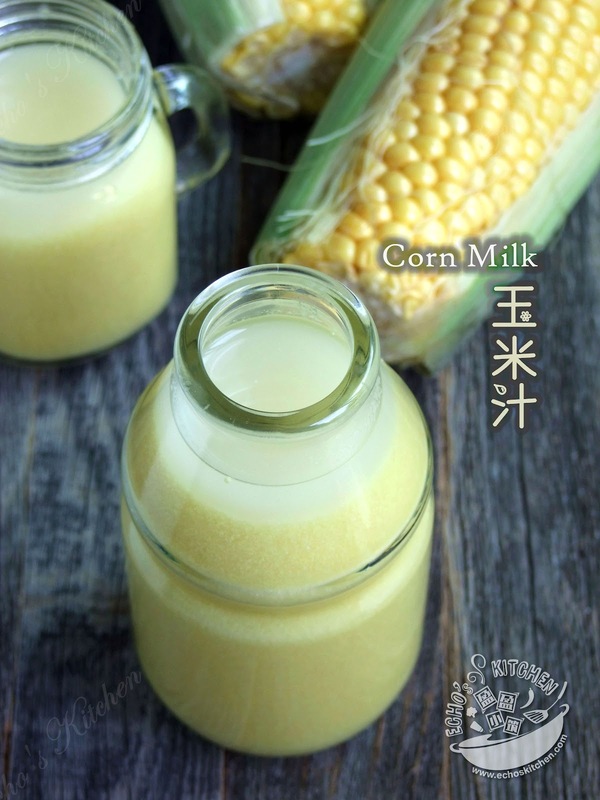 Last week the local farmers market had a promotion on sweet corn, I brought a big bag of it and make this very refreshing corn milk. My son A is a corn lover. He fell for this corn milk instantly, he said : " I like it mommy!" With many of my fellow Malaysian friends showing their Ramadan feast on facebook the last couple of weeks, I started craving for nasi lemak to no end. Nasi lemak used to be my breakfast back home for years. I especially loved the small packets of Nasi Lemak wrapped in Banana leaves sold by street hawkers, it is simple, authentic and full of flavors. My love for nasi lemak probably was responsible for my weight and cholesterol level then, but then, it was totally worth it!! I had to make this nasi lemak for lunch this weekend, I could wait no longer. 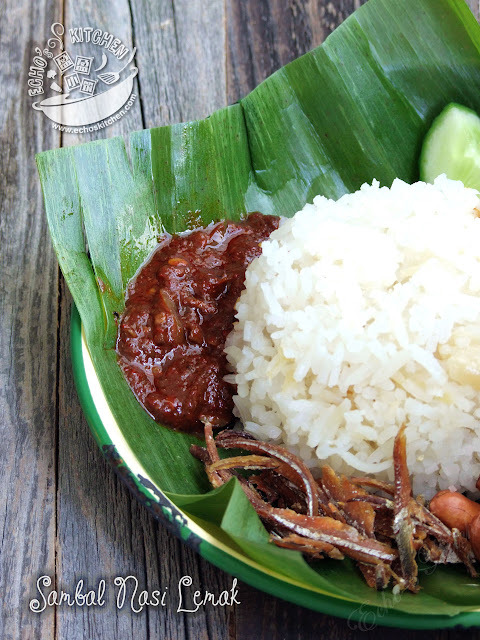 This steaming method really works great and my nasi lemak turned out just the way I liked it! The only thing I am missing here is a fresh banana leave! 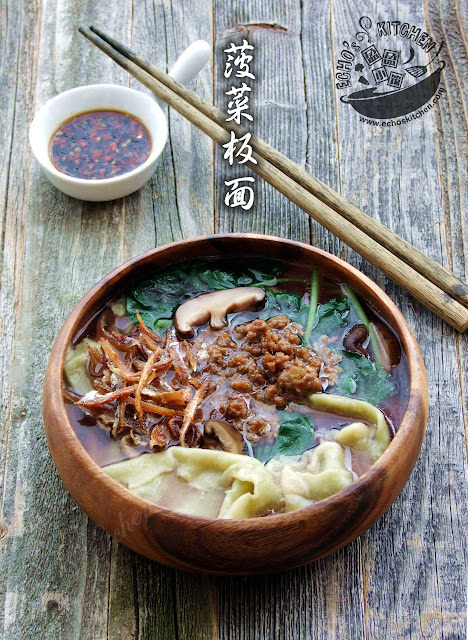 P/s：Original recipe was written on 7/26/2014, updated with photographs. I made some steamboat for dinner few days ago and was left with some fresh mushrooms. 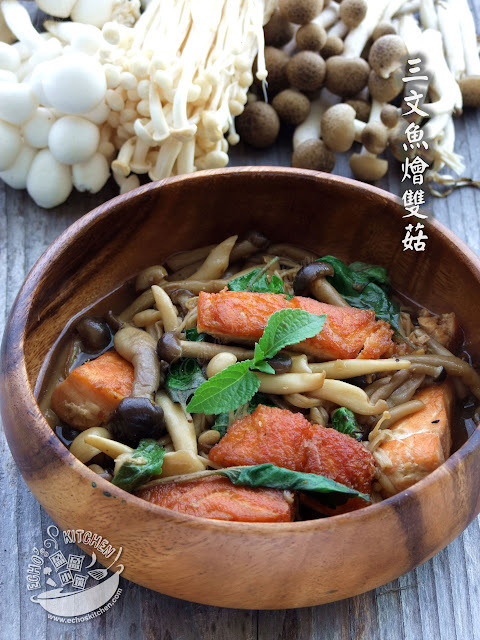 I made this mushrooms fish dish, very delicious. 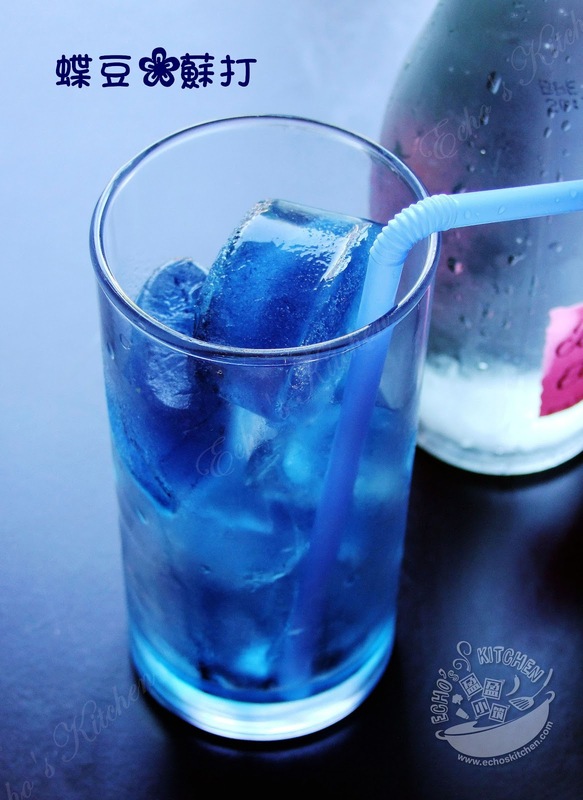 I made Blue Chai using the butterfly pea flower not long ago, the color of the drink is so beautiful that I can't stop looking at it. I then freeze some of the unsweetened blue chai in ice cube box and use it today to serve with soda, it makes the soda looks so dreamy and beautiful. A good idea to serve over party! I have been a little lazy lately, not working out as much as I should. It has got to do with my poor sleeping pattern. So I was really looking forward to the long weekend so that I could get some much needed rest. As planned,this weekend was a quiet one, our dear friend A came from NYC and spent the afternoon with us on Saturday, we had fun chit chatting and went out for a good Indian dinner at a nearby restaurant. Sunday was rainy again so we decided to stay in and enjoyed a few movies at home. 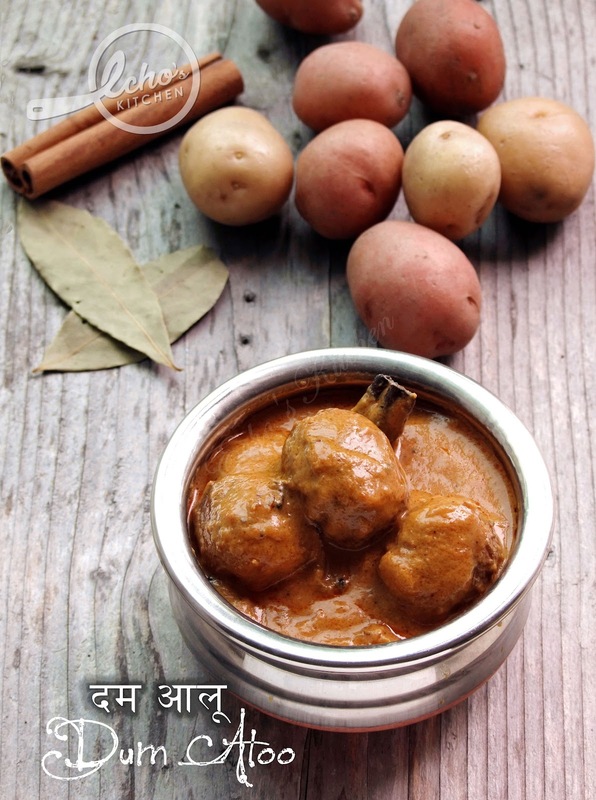 N had requested potato curry sometimes ago, since I have been wanting to blog on Dum Aloo for a long time, I made this yummy dish for lunch, it is really creamy and delicious! I planted some Amaranthus last year during the summer, but the yield was low, I did not uproot the plants and let it die on its own. Little did I know that Amaranthus is so hardy that it survived the winter and came out on its own again this year, only stronger. 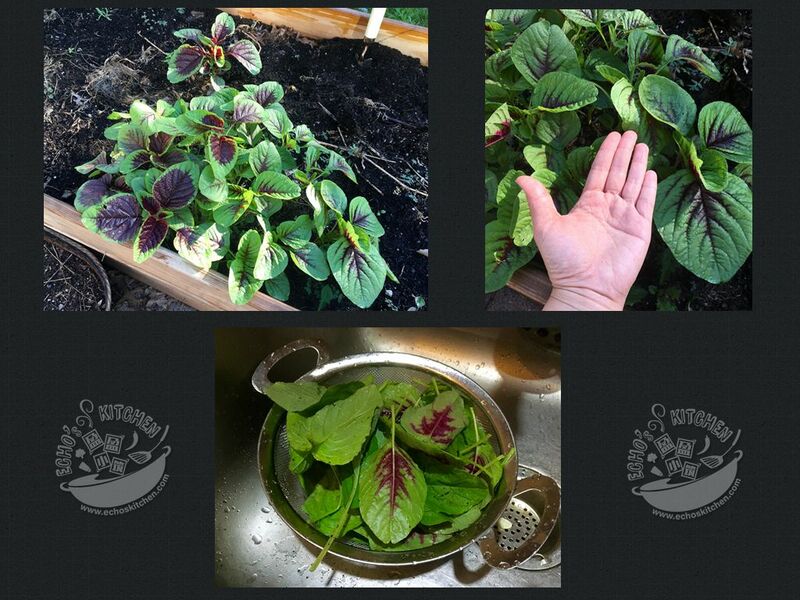 It gave me palm size leaves that look amazing, though I have not planted much this year, my Amaranthus did give me a chance to enjoy home grown vegetable! I harvest some to make this Pan Mee today, which I made the dough using spinach, I liked that the red Amaranth makes the soup a little pinkish in color, beautiful and full of nutrients!